To order your easy to fit motorcycle paintwork protection kit please scroll down to select your manufacturer and place your order. Our paint protection film self fit DIY kits come with a minimum 5 year warranty. 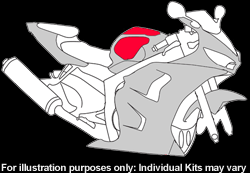 The kit is pre-cut to fit your motorbike like a glove and they couldn’t be easier to buy, using Chipguard UK’s mail order service. Take a look at the installation instructions and video to see how easy it is to fit the DIY kit. However, should you prefer, our Chipguard 3M trained professional technicians offer a full installation service at our dedicated workshop in Waterlooville. To enquire about this service please contact us. our films are the market leaders in paint protection films and has been tested worldwide. The results have shown time and time again that it is the clearest, strongest paint protection film on the market and twice as strong as it’s leading competitor. It has a high gloss finish which enhances and protects the appearance of your motorbike and it will not yellow with age. The optical clarity allows full light transmission from your headlights, whilst it’s strength protects the headlight and fairings from possible cracks and unsightly chips. Our film is UV stable thus avoiding differential fading. Our paint protection film will not shrink or creep, therefore preventing an unattractive “orange peel” appearance. Our film offers a high level of protection to your motorcycle paintwork against stone chip damage and minor abrasions. It not only maintains your bike’s A1 appearance and resale value. To place an order for your DIY easy fit kit, select the manufacturer from the list below and scroll down to find your model. 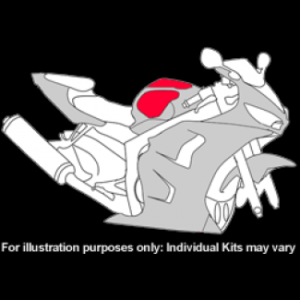 Decide between either a full kit or a tank kit (the diagram illustrates which areas are covered by each kit). Click on the “add to basket” and to complete your purchase, continue to “checkout”.